The 7.1-magniture tremor that hit Japan exactly one month after the devastating earthquake and tsunami reminds us that Fukushima has a long road of recovery ahead. Prime Minister Naoto Kun has publicly thanked people around the world for their support in Japan’s time of need. Yet, there is still more we can do. Today, we are acknowledging the efforts for Felissimo. The Japanese company had a similar experience over 15 years ago when an earthquake hit Kobe – where it is based. This experience has prompted them to launch various relief efforts on behalf of Japan. Felissimo has provided immediate aid to the region by donating money and emergency supplies but the company knows that the relief effort must be multi-tiered. With that in mind, Felissimo developed three competitions with DESIGN 21: Social Design Network, calling on designers to lend a creative hand. 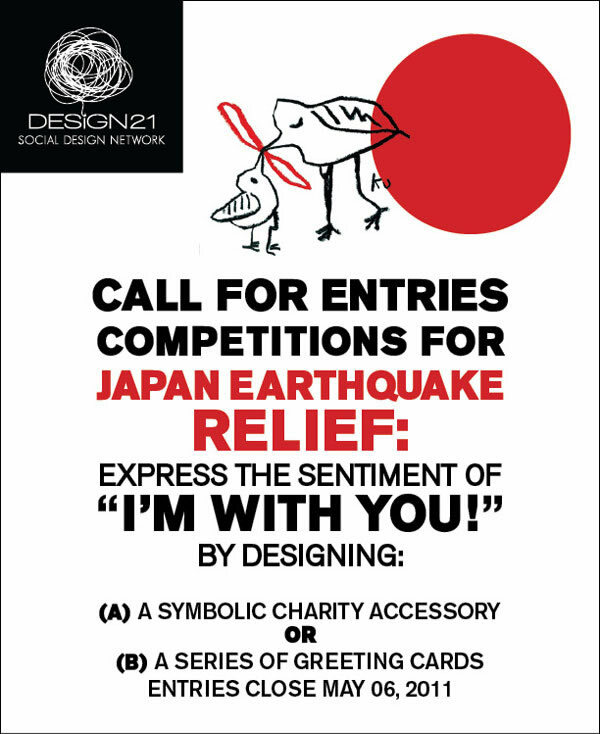 Two are design/product competitions aimed at fundraising where 15-20% of the proceeds will benefit the Japan Earthquake Relief Fund established by Felissimo. The third competition calls for an idea that contributes to long-term relief, recovery and rebuilding. Propose an idea that utilizes the power of design and offers a solution to a known or imagined problem.